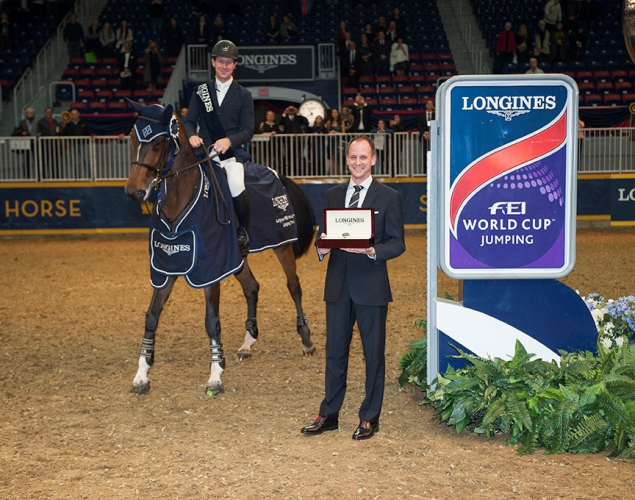 Longines FEI World Cup™ Jumping North American League: Usa’s McLain Ward and HH Azur win in Toronto. A heated, head-to-head battle between two experienced, international riders treated the spectators at the CSI4* Royal Agricultural Winter Fair in Toronto to the highest level of show jumping competition, but it was ultimately McLain Ward (USA) who claimed the victory of the $132,000 Longines FEI World Cup™ Jumping qualifier aboard HH Azur. Sitting in the enviable position of going second in the jump off, Ward strategised a win that left the rails up, albeit with one time fault, after he had the opportunity to see Dermott Lennon (IRL) and 13-year-old Irish Sport Horse mare Loughview Lou-Lou (Limmerick x Jack of Diamonds) drop two rails in the final round that recorded a time of 42.04 seconds. This allowed Ward to utilise the scope of his 9-year-old Belgian Warmblood mare (Thunder van de Zuuthoeve x Sir Lui) to leave all the rails standing and with a time of 47.58 seconds. The course, designed by Richard Jeffrey (GBR), was over 13 obstacles with 16 jumping attempts and demanded the precision of both horse and rider at every step. The internationally acclaimed designer first built at The Royal in 1994 but had yet to return since 2001. Ward has a long history of success at The Royal, earning the unofficial title as its king. Now with seven World Cup qualifier wins at the historic show, Ward had another successful trip across the border also winning a 1.40-meter grand prix aboard Carneyhaugh Manx (Ard VDL Douglas x Hampton Clover) earlier in the day. “The Royal is a second home for me,” Ward said. “My daughter and wife are here. My father [Barney Ward] competed here for a number of years, and now for my daughter to come and be part of this, it’s very special and a bit emotional. The iconic horse show is in its 93rd year, and although it has hosted World Cup qualifiers in the past, it is just as honored to be a part of the newly launched Longines FEI World Cup™ Jumping North American League. As the only horse in the field to leave all the rails standing after two technical rounds, HH Azur has undoubtedly earned Ward’s praise. “It’s a bit of a dream,” Ward said. “She’s a horse of a lifetime if I hadn’t had Sapphire, but to get a second one like this is pretty incredible. I hope I do her justice and manage her well. The mare also entered the ring feeling fresh after seeing the hitch horses in the warm-up arena, according to Ward. He also noted that although she jumps big, the most important aspect to controlling her ride is to manage her large stride, particularly indoors. An international start list of past Olympians and young, up-and-coming talent had difficulties at a variety of the course’s presented questions, but Jeffrey did not doubt that some of the six riders with four faults would go clear given another chance. Rideability played a major role in Jeffrey’s design, with a focus on genuine height and width throughout the course and without an unduly tight time allowed. Lennon has ridden the mare for four seasons now, getting her at the end of her nine-year-old year and after she came back from an early injury. Roberto Teran (COL) and 12-year-old, Dutch Warmblood mare Woklahoma (Sheraton x Calvados) rode to the fastest, four-fault score in the class. 8. Appy Cara (Erynn Ballard), CAN, 4/78.35. Previous articleRiders gear up for championship climax as speed demon Abdelkebir wins opener. Next articleOlivier Philippaerts easy on the $ 35,000 Brickenden Trophy CSI4* in Toronto . Van Der Vleuten, a champion in the making. Guillaume Foutrier with the Mijas Grand Prix. Tracy Fenney surprised at the $86,000 MD Barnmaster Grand Prix CSI2*. Darragh Kenny wins ahead of this evening’s Grand Prix.